For everyone, in the course of our mortal lives, our bodies undergo changes which are consistent with aging and the debilitating nature of the human being. More often than not, this is usually the reason some people (who can afford it) go for cosmetic surgeries, at other times and still for other people, their reason for going under the knife might be to rectify a particular feature they have had for a very long time or to improve their looks after sustaining an injury from an accident. In any of these cases, celebrities are usually involved with a good number of them getting their desired look afterward while some others still get botched despite their high social standing. 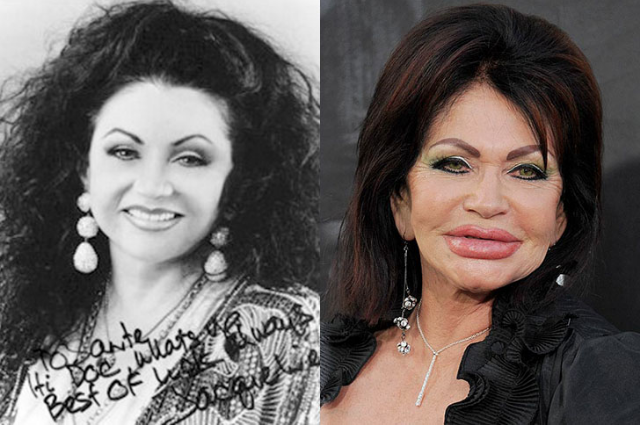 Here are shocking celebrity plastic surgery disasters that should have never happened. Let’s get started in the fashion industry, with our focus being on Donatella Versace. As you can rightly tell, she is associated with the luxury fashion company Versace where she serves as chief designer and vice president of the coy. 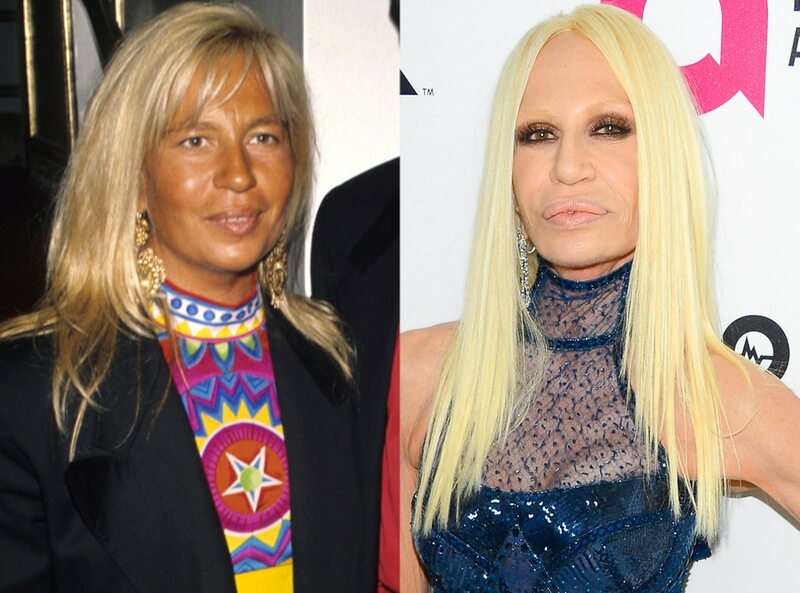 Donatella Francesca Versace comes out top on any list of celebrity plastic surgery disasters. She is reputed to have had multiple cosmetic surgeries since the 90s. Her most prominent enhanced feature is her plump over lip which is way bigger than her lower lip. Her skin also looks waxy which suggests multiple laser treatments. The Italian fashion aficionado had in the past admitted to using botox on her face but has never disclosed if she had other parts of her body worked on. Despite the public’s opinion about how she looks and the reason we listed her here, Donatella Versace is not known to be perturbed about her looks which to the public is not admirable. Ordinarily a handsome man, Mickey an American actor, screenwriter and retired boxer perhaps came into this list as a result of circumstances he couldn’t have helped. During his days in the boxing ring where he threw punches as well as received a proportionate amount on his face, it got to a point where he needed reconstructive surgery to mend his facial injuries. However, the former pugilist was botched, he even admitted that he went to the wrong guy who made a mess of his features. 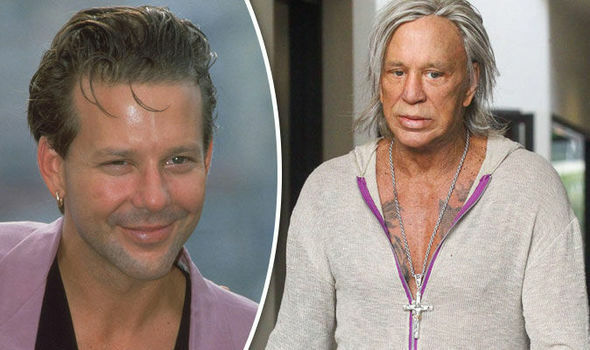 Mickey Rourke now spots a hair transplant with a badly done facelift which marred his sideburns and gave him an attached earlobe. If only there was a way of undoing what plastic surgeons did to Jocelyn, we would have made a post entirely dedicated to her miraculous facial rebirth. However, as it is, her inclusion on this list of celebrity plastic surgery disasters will suffice for the purpose of her securing a deserving spot here. Jocelyn Wildenstein started experimenting with plastic surgeries in 1997, she had his-and-hers eyelifts with her husband Alec Wildenstein before doing a whole lot more totaling to about $4 million. However, with each new work done on her face, she became worse off and today serves as a lesson that once botched, one can never be un-botched. There are some people you look at their before and after pictures and you can’t just figure out why they went under the knife. Axl Rose is one of such. He is a musician famed for his evergreen hit songs and spectacular voice which was greatly missed after he went awol in the mid-90s. Following his re-appearance in 2006, Rose shocked everyone who knew him before. For what reason you may ask? The once handsome rock musician came back showing obvious signs of excess botox injections, hair plugs, facial fillers, and a facelift job. People began asking questions as to why he had to go for plastic surgery, and a terrible one at that. It turned out that due to his bipolar disorder, pride and fear of aging, the musician felt he could buy more time from nature to retain his youthful good looks. Well, we can all now see what that venture resulted to. Just like her late brother Michael Jackson, La Toya had the Jacksons’ signature plastic surgery; little pointy nose with cheek and chin implants. She is perhaps not among the ugliest on our register of celebrity plastic surgery disasters, but looking at her pre-plastic surgery pictures, La Toya would have been looking a lot better at her age should she have retained her natural looks. Therefore, her facial job merits being considered a disaster. Some say he was never looking normal and even looks scarier now with an enhanced face. Carrot claims that he has had no enhancements done to him but plastic surgery experts think otherwise. The comedian suddenly has a smooth, no-freckle face and an excessively arched brow. Reports have it that his muscular looks are as a result of his use of steroids, while his suddenly smooth face was achieved with laser treatment or chemical peels. Whether Carrot admits it or not, most people opine that he is one of the many celebrity plastic surgery disasters that shouldn’t have ever happened. Being the first lady of France, Carla’s plastic surgery made headlines in 2012 when her husband Nicolas Sakorzy was winding off his tenure as the president of France. Moreso, she was rumored at the time to be having an affair with a young French musician. The former first lady, model, singer, and songwriter at the time was observed to have a tighter face, visibly stretched and light in color. Experts who commented on her new look observed that she probably had a cheek and lip fillers, nose job, botox injections, and Collagen implants. The end product left her looking worse off than we have always known her to be, thus deserving a mention on any list compiling celebrity plastic surgery disasters. Igor and Grichka Bogdanoff, jointly known as The Bogdanov brothers were French television presenters who got famous back in the day for their science fiction television show. Their career was spurred by their interest in astronomy as children and over the course of their pre-television career, Igor Bogdanoff earned a Diplôme d’Études Approfondies (DEA) in semiology which was later followed by a doctorate in theoretical physics while his twin brother Grichka Bogdanoff earned a diploma at the Institut d’Études Politiques (IEP) and capped it off with doctorate in mathematics. The duo first got media attention following the publication of their first book Clefs pour la science-fiction which saw them interviewed on TV. Following this and a series of other events that panned out well, they began presenting science fiction shows on television. In the course of time, the brothers got famous and were considered French television heart-throbs in much of the 80s. In 2010 however, it was reported that the brothers have had a considerable number of plastic surgeries; mainly cheek implants, botox, and fillers. Without sounding harsh, many people are of the opinion that the brothers somewhat look like the creatures they discussed on their science fiction show. Jackie Stallone is a nonagenarian who you may not know but should appreciate for the wonderful people she brought into this world. Jackie is the mother of famous American action film star Sylvester Stallone, actor, and singer Frank Stallone and late actress Toni D’Alto. Mrs. Stallone in her heydays was a celebrated dancer and promoter of women’s wrestling and outside the entertainment sphere, she is a versed astrologer. You might be wondering why we listed an over 90-year-old woman on our list of celebrity plastic surgery disasters, well the reason is not far fetched. Jackie got botched and even opined according to a certain report, that she now looks like a chipmunk. She admitted to having had multiple plastic surgeries all in a bid to retain her sparkle in an industry (Hollywood) where good looks are highly treasured. Nevertheless, when age beckons on one, it can only be held off but not for long. Despite her botched look, Jackie is still very much active unlike many people her age. Her secret is eating a bag of spinach boiled with an egg every day, playing the piano 2 hours daily, exercising with her physical trainer twice a week and taking tap dancing classes three times a week. It was said when he first came out in public after going under the knife that Wayne Newton had so much plastic surgery that his face could no longer move. The American singer and entertainer had a facelift, a nose job, and botox that was consistently done. As a result, there was a noticeable loss of wrinkles on his face which shouldn’t have been the case with someone of his age (over 70). Though the ace singer doesn’t look entirely botched when compared to some others on this list, but he has a face which only succeeds in making a facial impression at a great effort. 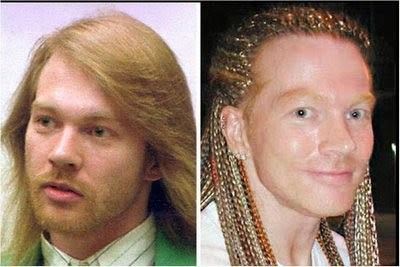 This no doubt secured him a spot on this list of celebrity plastic surgery disasters. It can be summarily said that Wayne’s face is not in sync with the rest of his body when he is talking, imagine saying something happy but your face doesn’t convincingly depict the same exhilarating feeling.